Teleflora has all of your Christmas Floral Needs! $75 Teleflora GC Giveaway! 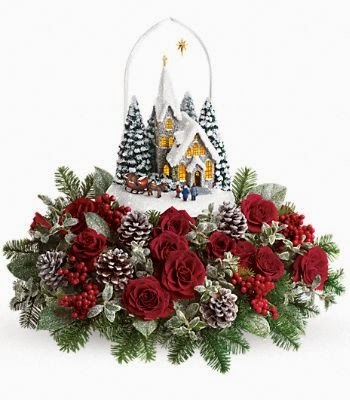 HomeTeleflora has all of your Christmas Floral Needs! $75 Teleflora GC Giveaway! 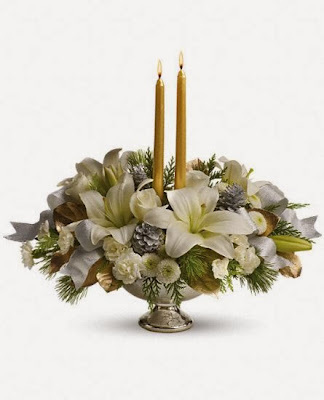 Teleflora's Silver And Gold Centerpiece starts out at $47.96! I thought Teleflora's Peppermint Sticks Bouquet was just adorable! It only starts out at $39.96! Now that you get an idea of the Christmas Floral Arrangements that that they have to offer, visit Teleflora via the link in the paragraph above and see what arrangement would be great for your Holiday Party or Get Together. Going to a party? You can get the Hostess a gift too! Send Cheer and bring the Holidays home! You can get 20% off with this Teleflora Promotion Code too! Code is valid until 4/15/14! Click the link or enter the code BLOGGER5F at checkout! Be sure to visit Teleflora on their social media to stay up to date with the latest! Like this post? Feel free to hover over a photo and Pin to Pinterest, you can re-tweet via the widget below! Thanks for reading! 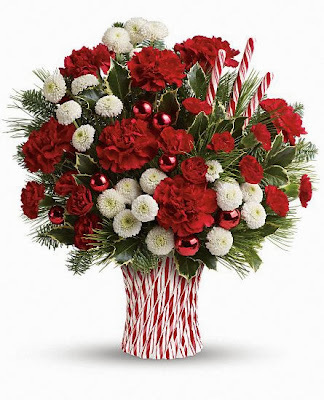 Bring a little #HolidayCheer into your home with @Teleflora this year! http://t.co/ZQD2uPGTsm @bre631989 is giving away a $75 Gift Code! Win it: One lucky reader is going to win a $75 Gift Code to bring Teleflora in your home this Holiday Season! This code can be used at Teleflora.com for $75 (plus the $14.99 service fee is waived). If you purchase a more expensive bouquet, you will just have to pay the difference. Enter with the giveaway tools below! Giveaway ends 11:59 PM CST on 12/13! Winner will have 24 hours to email me back to claim their prize. Open to the USA only. No purchase necessary to enter. Completing all entries will increase your odds. Please note this gift code is a ONE time use! Goodluck and thanks for entering! I'd like the Peppermint Bouquet. The Royal Holidays arrangement is beautiful as well as the Imagination Blooms with Cymbidium Orchids!! I love the Teleflora's Opulent Orchids. I LOVE that Thomas Kinkade's Starry Night by Teleflora bouquet - very cool! I really like the Deck the Halls Tree. It's very festive and would make a great gift for the Christmas gathering host! The Teleflora's Jeweled Ornament is beautiful. And you can reuse the globe. I love the Deck The Halls Tree! I would probably pick the Deck the Halls Tree for my mom on Christmas or the Imagination Blooms with Cymbidium Orchids for my mom on her birthday! I like the Berries and Spice bouquet. I like the Timeless Cheer Bouquet. I also like the Thomas Kinkade's Starry Night! I love the Mercury Glass Bowl Bouquet! The Mercury glass Bowl Bouquet. Very pretty! I love the Be Sweet Bouquet. I LOVE the Thomas Kinkade's Starry Night. It would look beautiful on the dinner table Christmas day. I really like the Hug Cuddle Bears but I'd order the Snowman cookie jar for my mom. She'd LOVE it! I love the Tulips and Pine! I like the one called Spring Romance. Thomas Kinkade's Starry Night is the one I would choose.... i LOVE LOVE LOVE Thomas Kinkade!!!! I like the Silver And Snowflakes Bouquet. I would get the Teleflora's Snowman Cookie Jar Bouquet for my sis in Texas.